How does the electricity cost calculator work? 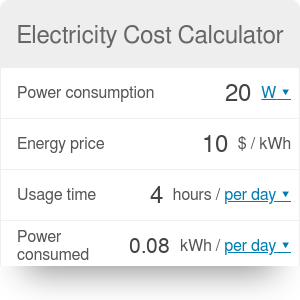 Electricity cost calculator allows consumers to estimate annual electricity cost in a straightforward way. Paying those monthly bills it's normal to ask: how much does electricity cost? Plotting down a few values in this electricity calculator will save you some time and give you a precise answer to the question, for example when you consider switching to LED bulbs. You might also want to see electricity cost - single usage calculator. It's rather simple. If you know the value for power consumption, energy price and usage time, the calculator will automatically display how much power you consume per day and generate the exact annual price for electricity. You can change units at will (for example change days to months or watts to kilowatts). Let's suppose the following for our utility. If we know that, then our electric bill estimator will tell us that we'll consume 10 kWh / day and the annual cost will be € 1022.70.
power consumption * usage time = power consumed. So we'll consume 10000 watt hours or 10 kilowatt hours of power every day. The electricity cost is cost = power consumed * energy price. It's easy: 10 kWh per day * €0.28/kWh = €2.8 per day. For the annual cost, simply multiply the daily one * the number of days in a year. €2.8 per day * 365.25 days = €1022.70. Same as the electricity cost calculator told us (surprised?). Now that you know how much electricity costs, you might be interested in saving money with price per quantity and discount calculator. Electricity Cost Calculator can be embedded on your website to enrich the content you wrote and make it easier for your visitors to understand your message.